Yuntone Car Seat Headrest Mount Holder for iPad/ Samsung Galaxy Tabs/ Amazon Kindle Fire HD/ Nintendo Switch/ Other Devices 4"-10.1"
One-handed installation and release within 2 seconds. Multi-angle rotation to adjust for the best viewing angle. Charge hole and headphone jack are all available. The distance between two metal posts on your headrest should be 4.1in-5.9in. Fit for iPad/ Samsung Tabs/ Amazon Kindle Fire HD/ Nintendo Switch/ other devices 4"-10.1". 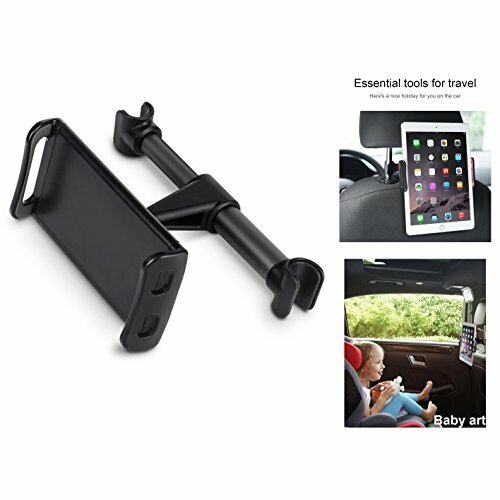 【Universal Compatibility】 Car Headrest cradle for kids works with all 4.0- 10.1-Inch devices, such as new iPad 2017 Pro 9.7, 10.5, Air mini 2 3 4, Accessories, Samsung Tab, E-reader, Kindle fire, Nintendo Switch, Smartphones and Tablets. 【360°Rotatable & Charging Convenience】 360 degree rotation allows you to rotate any angle you desired, left and right reserved holest, would not block the data cable, earphone cable and power switch. 【Please Note】Make sure your headrest length is less than 5.9 inch and the diameter is less than 0.6 inch, otherwise you will not be able to install the car headrest holder. If your iPad is less than 8 inch, install your iPad level in the mount and rotate the mount to the angle you want. 【UPDATE VERSION】Reinforce the edge to ensure the stability of your tablet and thus greatly increase it's safety index. Increase the thickness of soft rubber cushion to 3MM to protects your tablet from scratches. 【High-quality & Enjoyable】 Stand for car headrest was made of Sturdy aluminum and ABS materials, giving you a enjoyable and safer trip. If you are not satisfied with it, please feel free to contact us, we will give you a pleasant solution. If you have any questions about this product by Yuntone, contact us by completing and submitting the form below. If you are looking for a specif part number, please include it with your message.